Welcome to Season 3 of the Anyone Can Teach Art podcast!! This week we’re talking about classroom management. We’re focusing on the art classroom but, of course, most of this applies to any classroom with children or even adults. Classroom management can be a real challenge for all of us, but there are some key principles that we can turn to over and over again to help us be the most effective teachers we can be. We mentioned our mom several times in the episode and even more when we were preparing for it. She has years of classroom experience and has a natural grace in the classroom. We’ve learned so much from her and we’re excited to pass some of her knowledge along to you. The goal is to maximize learning (not to keep everyone perfectly quiet). Know what you’re doing ahead of time- study your lesson plan! Plan something for students to do the moment they walk in. Signpost (tell students what you’ll be doing today) as much as possible. Plan ways to give students autonomy and choices whenever possible and then point it out to students. This reminded us of our favorite parenting book: Love and Logic for Early Childhood by Jim Fay and Charles Fay. We use tips we learned from this book in so many life situations! Organize your supplies to make it easy to find the supplies and easy for students to put supplies away. We also talked about organizing supplies on episodes #5: Organizing Art and #6: a Discussion of How to Organize your Art Supplies. Keep your voice calm and get quieter to help kids stay quieter. Hand a shorthand sign for when students need to be quiet and listen (a special clap, turning off the lights, a saying…). Offer advice on what they need to draw where. Draw on a separate piece of paper right next to the student. Draw two dots on the student’s paper and have the student connect the dots to create the line he/she needs. As a last resort, draw on the student’s paper to help them along. *** Always ask if they’d like you to draw on their paper before you make any marks on their paper! When a student finishes quickly and didn’t try very hard, verbally notice a nice thing about their art and then send them back to add more detail, texture, color, or background to their art. 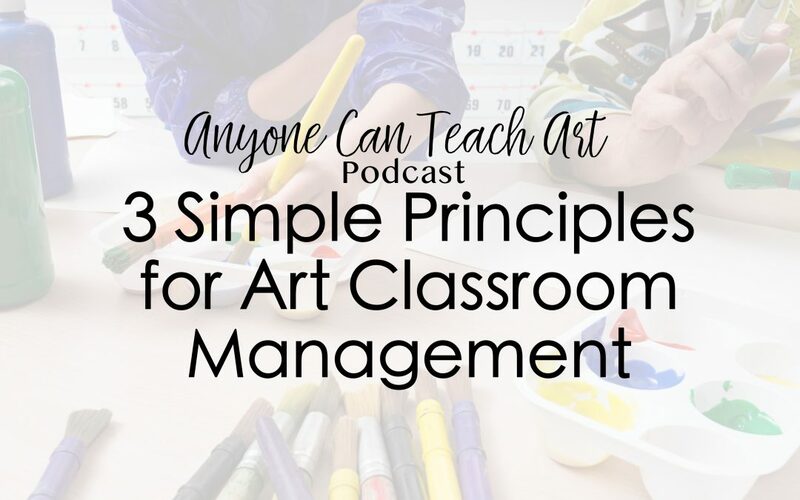 If a student doesn’t like this particular art project, remind them that they can draw whatever they want at home, but while in art class, they need to do the assigned project to work on this set of skills. Set expectations ahead of time and specify the consequences. Know in advance how you’ll handle kids who aren’t following the rules. Praise kids who are doing the right thing. Don’t give any threats or warnings. Just follow through with the consequences you told them about. If you’re in a circle, orient the most talkative students next to you and the least talkative students across from you. Do you have any tips on classroom management you’re willing to share with us? Comment below! I try to use affiliate links whenever possible. So, if you use one of these links I may get a few pennies from it. However, the cost to you will be the same. I promise that I never choose what to suggest to you based on the benefit I might receive from it. You can learn more about our affiliate policy here.